I have a one pound as well. To think I kept it as a souveneer when we were on only four and a half quid a week in the early sixties. I must have been crazy!!!!!!! GREAT MEMORIES THO. BAFs or BAFFS they were called, can't remember what that stood for though, The BA bit is probably British Army. I remember them as a child, What are these new ones then? Places Served : Taunton. Hameln, Herford, Werl, NI, Berlin, Helmstedt, London, Rhodesia. 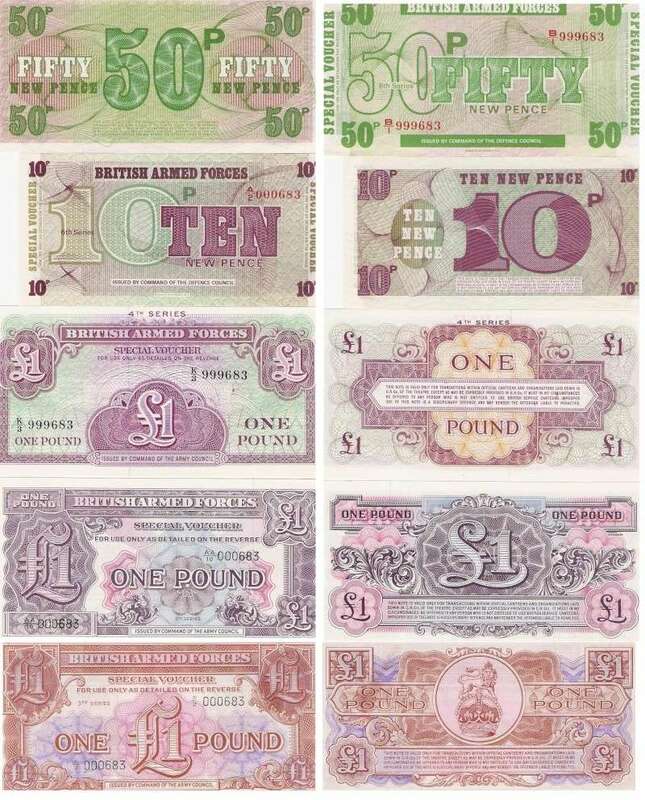 There were 3d,6d,1 shilling,ten bob £1. and upwards.One penny coins were o.k.I dont remember plastic coins tho.I recall still using BAFV,S IN 1960. I remember these and the plastic coins! I remember sitting in the Sally Ann or some such place as my parents or whomever would 'split' the edges of these notes and extract the sliver thread up inside (thereby reducing the face value to "0"). That would have been during our first tour (59-63) and I don't recall where the notes and plastic coins were used...I have it in my head they were, as mentioned, essentially 'in house' vouchers at the Red Patch Club, NAAFIs, Salvation Army canteens, and in the variou Messes...but I could be wrong. Oh yes, they were. I didn't mean to imply they were used out on the economy or in civilian environments. If memory serves -- always a risky proposition -- these notes were around during my father's first tour (1959-62) so I'd be not quite 6 years of age to age 8 or so but weren't around during our second tour (1969-72), at least not in any of the Canadian military/social environments. I think by then even the Messes used DM but as I was not one to accompany my parents to Mess functions or go to the Mess (far preferring to shuntle off to some of my favourite gasthofs with my friends) I can't say for sure...pretty sure, just not absolutely positive. The Sally Ann. Red Patch Club, etc were "army places". Certainly during our first tour, the Canadians were very much under the auspices of BAOR, although I am not sure how the hierarchy worked or exactly how much...whatever the word is I am looking for...the Canadians "owed" to BAOR. Certainly by our second tour the Canadians were far more independent of BAOR and worked in conjunction with rather than under, if indeed we ever "worked under." But I do recall seeing these notes and the plastic coins kicking around. 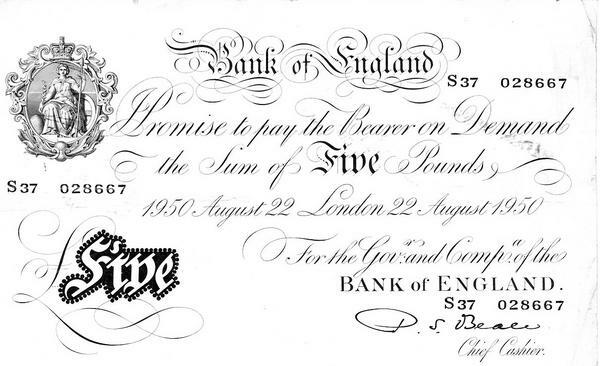 It may be that, as Canadian personnel, my parents had privileges at various British military establishments and hence would have come into contact with these notes and plastic coins...in fact, as I think on this, that seems very likely. 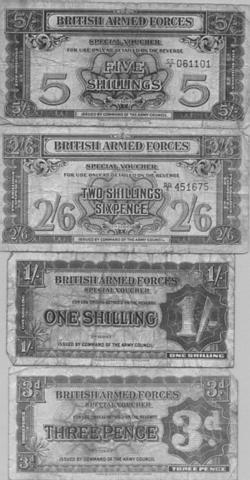 I remember the one shilling BAFFS purchased 20 Senior Service cigarettes in 1953-4. Our ration was 7 packets for 7/-. Tins of roll-up tobacco were not rationed, so most of us rolled our own and flogged the cigs to the locals. Canadians could use BAFFS too in BAOR. We were paid in BAFFS. We also used them in the NAAFI in Ripon, Bielefeld. We could exchange them for DM's. 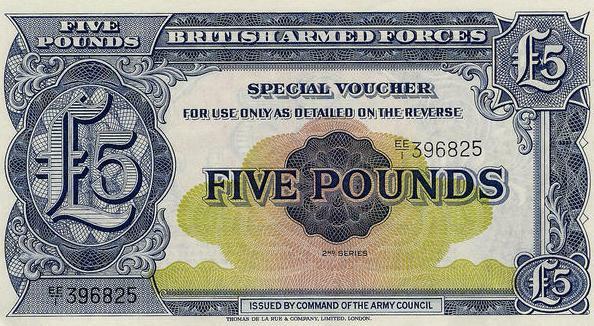 We could exchange UK £ notes for DM's, but there was a limit imposed by the British Goverrnment-not sure what it was-£50 then I believe! Good to see some have been preserved! 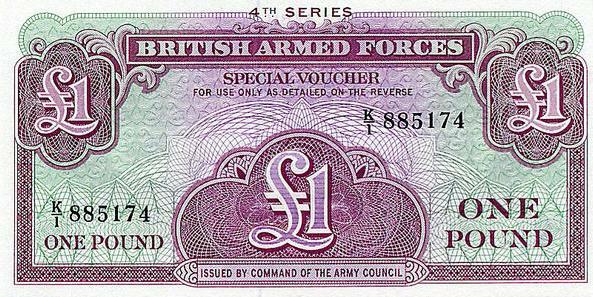 And that £5 pound note-had two of them in my first pay packet for a months salary in August 1945-and this is the first one that I've seen since then! I went round to My Mum's last night and I was telling her about this thread, talk about opening the floodgates of her memory!! She does remember the plastic coins but seems to think they weren't much used? She said that Dad got paid in BAFFS but the unit pay office would then convert these into DM's for you, BUT also most German shops prior to 1950 would accept them as valid currency at an exchange rate of DM 30 to the pound. Obviously I don't remember that, but I do remember that when I joined up the exchange rate was DM 12 to the pound Sterling. Soldiers put in their pay requirements on a Monday specifying how much to be in BAFSV and how much in DMs. I have spend hours trying to change BAFSV for DMs on a Saturday in order to visit the local guesthouse!! It was also illegal to sell cigarettes or coffee to locals but it was one way of getting hold of DMs!! So there you go folks-different memories from different people-fantastic trip down memory lane! But it is all a part of military history preserved for the future! If you got the BAFV/DM mix wrong on payday, you could also change them at area pay offices. I was often sent on my bike in school holidays to the local pay office to change one or the other. Reading the item brought out many memories to me.I looked in my treasure chest of Army memories and lo and behold a BAFV note did I find - value 3p.I remember it was forbidden for local civilians to have them,and they could not be used in German shops.I must say I do not remember BAFVs in coin form?One funny story I do recall with reference to this money,I was out in the forest picking heideberries(anyone remember? )when I came to a flattened patch of grass,and on this I found 3 Pounds and some smaller notes.I can only assume that someone else had been there,but not to pick heideberries! I remember in Detmold going to school one day in 1956, [I was 6 years old at the time] We were met at the school gates by a number of 'army' guys with trucks, they asked us our age, if we said 7 or above they put us, [ I lied to be with my older brother] in the backs of the trucks. 10 minutes later we found ourselves at a potato field! 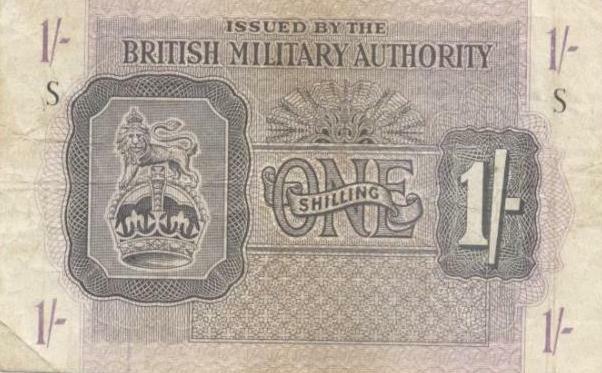 We spent all day picking potato's, at the end of the day they gave each one of us a brand new crisp 1 shilling note! I have to believe that this was all pre-arranged, but could it happen today? not a chance! aah those were the days! And I can remember when you could get a whiskey with 6p worth of BAFVs! When I was with my family in Hamburg in '48-'50 we were only allowed to use the BAFVs in the camp. NAAFI, Mess and in my case, the stables. If we wanted any fresh foods from the German shops we sold our weekly tin of coffee to the maid for Reichmarks then Deutschmarks when these came in. ('48 or'49 I think.) I was 15 and when I got my pocketmoney I had wads of paper money. Not that it amounted to much. I never had enough to think of saving any!